“My lesson,” Mycroft said as he checked again to make certain he had everything on the list. He checked off each item lined up in front of him on a tray: a bowl of lemons cut in half by Cook, a box of baking soda, a bottle of dishwashing liquid, a measuring cup, a set of measuring spoons, a smaller measuring cup, and a tall, 12 ounce glass. “Why?” asked Sherlock, bobbing once as he got tired of standing on tiptoe. Mycroft carefully wrote down the title of the experiment, the date, and the time in his workbook. He then wrote down his name as the researcher. He unconsciously chewed the end of his pencil for a moment as he thought about what to write down next. He glanced at his brother who was now bobbing up and down like a jack-in-the-box. 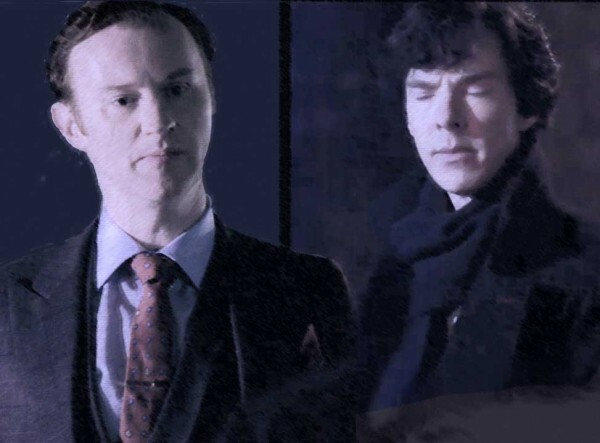 Mycroft wrote in his workbook “Assistant: Sherlock Holmes” and showed it to Sherlock who took the workbook in his hands and stared at it hard before giving it back to Mycroft. Then Mycroft very carefully squeezed the juice of two lemon halves into the smaller measuring cup and carefully recorded the amount in his workbook. Mycroft now measured out eight grams of the baking soda and placed it in the bottom of the tall glass. He methodically recorded the amount and the action. Next, he measured five milliliters of the dishwashing liquid and place it into the tall glass and stirred the baking soda and the dishwashing liquid together. “Yes, it is gooey,” agreed Mycroft. “We need to make a note of that in our research log.” He meticulously wrote down the steps and the results in his workbook. Mycroft proceeded to pour all the lemon juice into the glass. The goo at the bottom fizzed up in an eruption of foam, overflowing and running down the outside. Sherlock’s eyes widened and he giggled with delight. Sherlock furrowed his little brow into a scowl and his mouth into a frown, but didn’t say anything. Mycroft bent over his workbook and began studiously writing. He paused to read what he’d written, vigorously erased a paragraph, and hunkered over his paper to re-write the offending words. He then began to draw a picture of his experiment. He looked up to scan the tall glass of foamy soap just as Sherlock was bending over and lifting the glass slightly to his mouth. “Ewww!” Sherlock said, dropping the glass the few inches back onto the tabletop where it promptly fell over and the foam flooded the table. Mycroft rescued his workbook with one hand and swept his brother out of the way with the other. He watched in horror as the mess spread and began dripping to the floor. Sherlock was still pressed against Mycroft spitting and making faces, but he was slowly slipping to floor. Mycroft pulled him back farther away from the expanding muck. He set his workbook on a dresser and knelt down to face his brother. “Yes. And lemon juice and baking soda. Come on. Let’s get that taste out of your mouth.” Mycroft took his little brother by the hand and led him to the bathroom. He filled a glass with water and said, “Take a drink and then swish it around your mouth and then spit.” Sherlock looked at him skeptically. “Like this,” Mycroft said before demonstrating the procedure. Sherlock made a tentative effort in case there was something other than water in the glass and then he seemed to take great delight in the process. Mycroft left him, taking a towel into the other room and cleaning up the spilled experiment. When he returned he found Sherlock had rinsed and spit with greater and greater energy until the water had spilled out of his mouth onto his clothes. Mycroft sighed. Now he needed to clean his little brother. It took a full thirty minutes before Mycroft could go back to his work. He looked down the hall, but Nanny still hadn’t returned. Mycroft looked back at his brother who was climbing back onto the chair at the table. Mycroft fetched his workbook and another pencil and sat down next to Sherlock. “Right. Citrus limonum is its botanical name. Can you say citrus?” Mycroft chewed on the pencil’s eraser as he read over the next assignment. He got up and found a small paintbrush near the art supplies, when he turned around, he saw his brother about to lick a lemon half. Sherlock simply stared at him and shook his head. Sherlock tentatively held out his hand. Mycroft took it and said, “Spread out your fingers.” Then Mycroft gently dipped the palm of Sherock’s hand into the bowl of lemon juice and pressed it against a clean page of his workbook. “Right again. All we have to do is apply some heat, like this.” Mycroft picked up his workbook and walked over to the table beside Sherlock’s bed. Sherlock clambered off the chair and followed. Mycroft then took off the lampshade and turned on the lamp. He then held the page of the workbook with the names on it up close to the lightbulb. Sherlock gave a dramatic sigh, but said nothing. As the paper heated up, the names began to appear brownish-red against the white paper. Sherlock’s eyes grew large. Mycroft did the same with the next page and soon Sherlock’s handprint faded into view. After Nanny left, Mycroft dragged the heavy basket over to his dresser and began methodically putting away his undergarments and pajamas. His shirts and trousers would arrive neatly pressed and ready to hang in the wardrobe. Next he dragged the laundry basket to his brother’s dresser and started putting away all of Sherlock’s things. Pants neatly rolled and lined up beside the socks which were systematically arranged by color. Shirts and shorts also arranged by color. Just as Mycroft was putting away the last set of pajamas, he heard a splash and looked quickly at the table. Sherlock looked up startled, lost his balance and fell to the floor with an emphatic crash. Mycroft raced over to see his brother blink once in shock and then open his mouth and say, “Ow!” Mycroft bent down and Sherlock wrapped his arms around Mycroft. Mycroft could feel the sticky, little hands on his neck as he lifted his brother. As he set Sherlock down on his bed, Sherlock began to wail. Great, monstrous tears began to fall down Sherlock’s cheeks and onto Mycroft’s shoulder. Mycroft was rocking his brother and saying, “Shh. Shhh. It’s going to be all right. Let me look at you.” when Father, followed by Mummy, came into the room. “What’s all this about?” his father asked. “I see. Here.” His father pulled out a huge, white handkerchief and handed it to Sherlock. “Blow.” Sherlock did and offered it back to his father. Mycroft took it and wiped away the tears still on his cheeks before folding it up and putting it in his own pocket. “And where is Nanny?” asked Mummy. “Fetching our tea,” answered Mycroft quietly. He knew what was going to come next. “I was putting away the laundry.” With the arm not cradling his brother, Mycroft pointed to the abandoned laundry basket and its lone pair of sleepers. Mummy sighed. “Mycroft why is your brother always sticky?” Mummy asked. As she said this Mycroft became aware of a growing odor like paper burning. Then he saw with horror the small, reddish-brown handprints appearing on the lampshade beside the bed and before he could think what to do, the shade caught fire. It didn’t burst into flames or anything near as dramatic, but a small flame did ignite at the right thumb of the print in the front of the shade. Within a moment Mycroft’s father had snatched up the first wash cloth and extinguished the tiny flame. Next he whipped the shade off the lamp and stared at it. After their parents had left the room, Sherlock started to get up. Sherlock nodded, his lip still quivering a bit. He swallowed hard and then reached into the basket of books beside his bed. Mycroft returned quickly and gave the wash cloth to Sherlock. He climbed upon Sherlock’s bed and adjusted himself so that he sat against the headboard with his legs outstretched in front of him. Sherlock curled up beside him with the newly cold wash cloth pressed against the side of his face. Mycroft kept reading and pretended he didn’t know why Sherlock had chosen this particular book, but he was glad Nanny came with tea before the mother elephant was shot. After tea, when Sherlock was tucked into bed, he agreed to let Mycroft switch to Encyclopedia Brown Solves Them All, but only after Mycroft told Sherlock he wouldn’t understand it because it was written for children Mycroft’s age. They’d only gotten to the second mystery when Sherlock started yawning and fighting to keep his eyes open. Within another ten minutes, Mycroft looked down and saw his brother sound asleep. Gently, so as not to awaken him, Mycroft slid his little brother beneath the covers. Sherlock stirred but didn’t open his eyes. In the glare of the lamp’s bare bulb, Sherlock’s right eye looked puffy. There was a dark blue cast to the skin around and next to it. Combined with the bandage above the eye, Sherlock looked like he’d been in a fight. Given his little brother’s nature, it was probably prophetic Mycroft thought as he turned off the bedside lamp and went to finish reading his history assignment. This entry was posted in FanFic, Holmes Boys and tagged FanFic, holmes boys, mycroft, Mycroft Holmes, sherlock, Sherlock Holmes on July 21, 2012 by JH Watson.